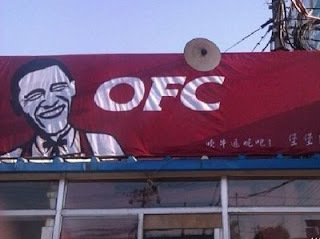 China Opens Obama Fried Chicken Restaurant China obviously doesn’t think much of President Barack Obama. In Beijing, China opened an Obama Fried Chicken restaurant. Yes, an OFC. Obama Fried Chicken. The age old stereotype that black people love chicken isn’t just of running joke in America, and being the president of the United States doesn’t get you exempted from such social stereotypes does it? On one end, America does owe China tons of money but this might be taking things too far. What do you think about China’s Obama Fried Chicken restaurant?